The materials and oil sector are looking really cheap at the moment. One can choose to invest in what's going up or what is going down. I prefer buying what looks cheapest and oftentimes things are cheap when there are blood on the streets. Here are some companies that have proven dividend histories and excellent credit ratings that I am highly considering currently. During a falling oil price environment, one could invest in depressed oil stocks or choose to invest in companies benefiting from reduced oil prices (airlines, transportation, discretionary). Since these companies that benefit from low oil have passed my buy marks, I am no longer interested and will pursue oil stocks. From the list, BP and CVX are the cheapest. 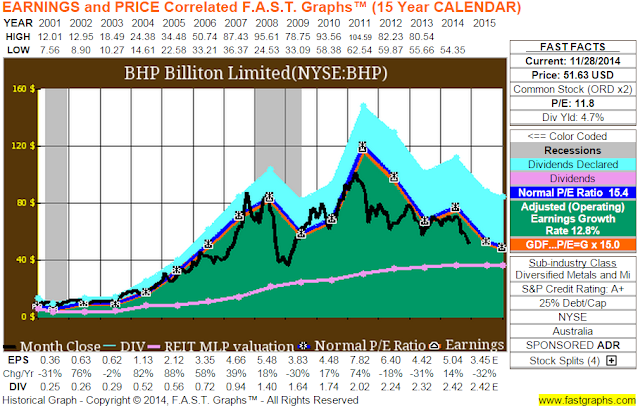 BP sports an impressive yield but in my opinion a riskier play than CVX or XOM. I am choosing to ignore drillers since I feel they are too volatile and sensitive to oil prices compared to very large oil majors. CVX, XOM, COP, and BP all have very high credit ratings. In the materials sector, stocks are plunging similarly. Below is a FASTGRAPH of BHP. BHP can also be bought using the ticker name BBL. For tax differences one should do their research as the reasoning behind purchasing BHP vs BBL won't be explained here. BHP has low debt, high yield, low PE (compared to historical average), A+ credit rating by S&P, and steady dividend increases.